The 170mm / 6.7" edge of this custom petty chef knife by Matthew Rubendall of Ruby Knives features excellent convex geometry with a full distal taper, culminating in a very usable, needle-like tip, perfect for detail work. 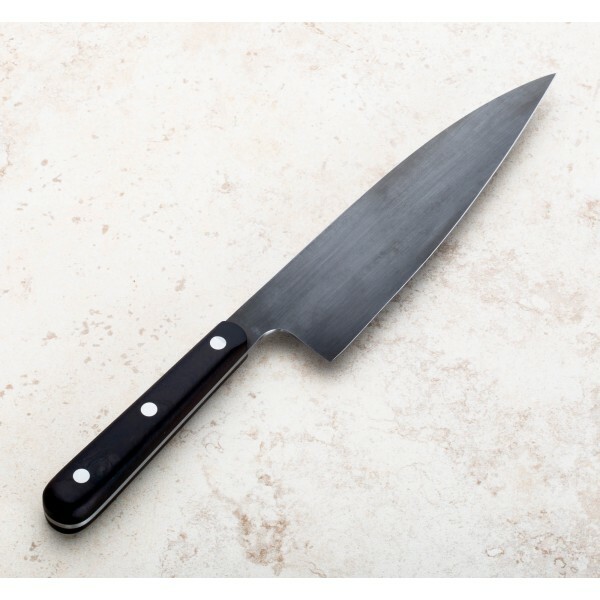 A forced vinegar patina which covers the 52100 carbon steel blade is contrasted by a polished, rounded, and comfortable choil and spine. 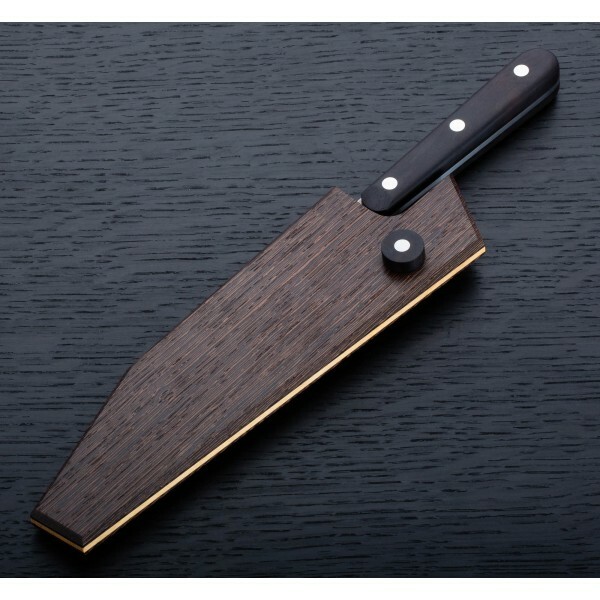 Brazilian Rosewood is shaped to form a simple, rounded and comfortable handle, stopping just short of the choil and designed to provide excellent and easy transition and comfort for use in a pinch-grip. 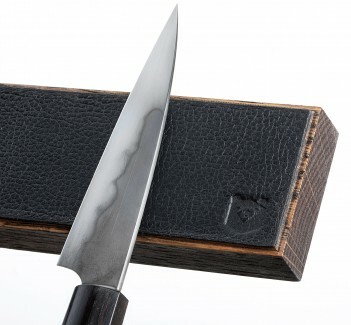 In wenge and spruce woods, the beautiful saya uses a unique, two-piece pin of turned ebony and steel. Matthew Rubendall of Ruby Knives builds sole-authorship handmade chef knives at his shop in South Brooklyn. 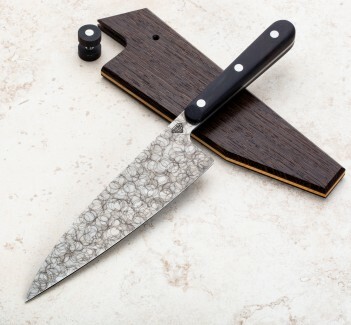 A long-time custom guitar maker, Matt's attention to detail and appreciate for simply designs and function-first style has made him a talented knifemaker with a classic, refined aesthetic that we love. 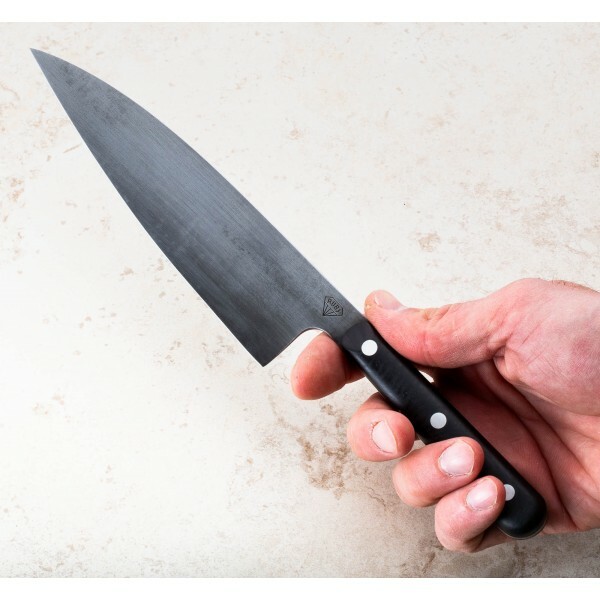 Blade length: 170mm / 6.7". Overall length: 295mm / 11.6". Blade width at choil: 2.5mm. Blade width 1" from tip: 1.0mm. Blade height at heel: 43mm. Weight: 4.7oz / 134g. 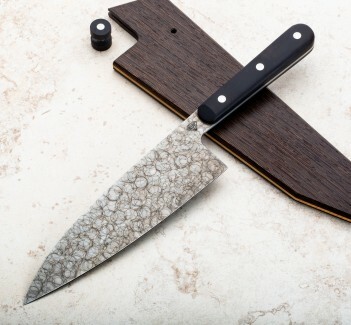 Blade: 52100 carbon steel with forced patina. Handle: Brazilian Rosewood. 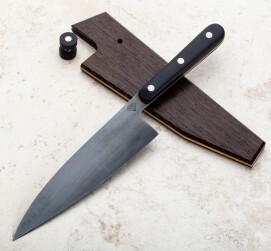 Saya: Wenge and spruce with ebony and steel pin.